LOS/Topographic Profiles: in geology these are topographic profiles or cross sections. Earthquake centroids--open database and plot location of earthquakes. Topographic Profiles: for maximum precision in measuring on the profiles and in getting a true visualization, select a short distance, and run the profiles in the dip direction perpendicular to the strike. OpenGL 3D views: block diagrams. Variable opacity merges: stack two views (such as DEM topography and satellite image) and adjust how much of each one you see. Topographic grain overlays: for an objective view of how organized the terrain is, and if the valleys and ridges align in a preferred direction. Get strike from Calculate, Bearing menu option. Measure dip from profiles or place a protractor on the profile if you assume the land surface follows the fault plane, and you draw the profiles perpendicular to strike of the faults. This can be a good assumption with active faults in arid climates. Get dip from terrain categories (from the Overlay, Terrain Categories menu). Select the slope in percent (100 * tangent) or degrees, and the matching terrain will be colored. If you would like to see all the slopes with a particular range of values, this can be effective in picking out large areas that could be fault scarps. Get dip from slope maps. Right click on the map, Select "Display parameter", and then pick "Slope". You should pick standard categories, and then use the button to select slope categories. You should pick categories to match what you are looking for on the fault scarps. Harvard data base locations (and many other earthquake catalogs) are accurate to 0.01°, so at the very best we can locate to about 1 km. This will be in addition to any errors in locating the earthquake; those errors will be greatest for small earthquakes, and earthquakes in remote location with a poor distribution of recording stations. ID epicenters, and get the strike and dip from the database record. The dip direction is not in the data base, but can be computed as 90 degrees from the strike. Remember that the focal mechanism provides two planes, one of which is the fault plane. DEM opened, and earthquake focal mechanisms selected with plotting by colored symbols. Plot single focal mechanism on the map by clicking . You can drag the "beach balls" to place them for best results. One of the two nodal planes will be the fault plane. The southwestern earthquakes lies in a valley, far away from any bedrock exposures. The strike appears to be approximately east-west, and the ridge to the southeast might represent the fault scarp. This shows the result of using the three point problem (on the structural geology computation window). After selecting three points on the SW side of the ridge, the computer calculated the plane which passes though them (N63W 21SW), and shows where its outcrop would project. The plane passes close to the epicenter, but the focus is 35 km deep, which would affect the results depending on which of the two focal planes represented the fault rupture surface. This dip is significantly different than the two focal planes ( N76W 45N, and N82E 47S), and the strike is different from the focal plane with a south dip). The ridge is probably not a fault line scarp from the fault associated with this earthquake. 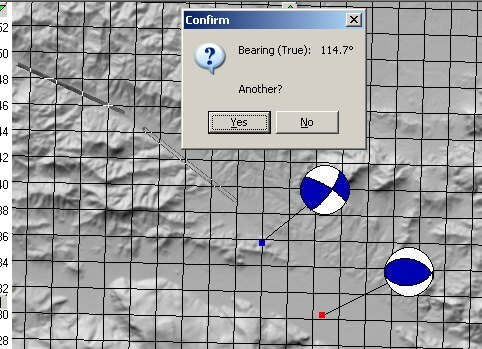 Calculate menu has a Bearing tool is being used to measure the trend of the long linear valleys in the NW part of the map, as they could be related to a fault. The 115 degrees measured is N75W, fairly close to the second focal plane. The segment closer to the dialog box actually has an even closer fit. The large number of valleys and lineaments oriented NW-SE suggest that the second focal plane may well be the orientation of the fault. Record of the southeastern of the two earthquakes, obtaining by using Identify data base records button on the map toolbar or the database table display and then double clicking on the epicenter. Explanation of the fields. 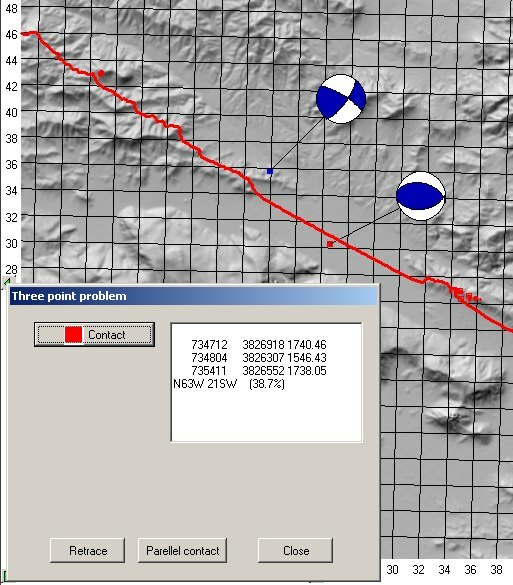 Record of the northwestern of the two earthquakes, obtaining by using the Identify data base records button on the map toolbar and then double clicking on the epicenter. OpenGL 3D view of faults and their scarps. This was selected on the Landsat TM of the area, so the view combines the satellite imagery with SRTM topography. You can rotate and zoom the view. Variable opacity merge combines TM satellite imagery with a reflectance view of SRTM DEM. This emphasizes the fault scarps, although the direction of lighting in the reflectance view determines which faults will be highlighted. In this option you can interactively adjust the opacity, and which of the two scenes dominates the display.